Jack Glenn's heartbroken mother, father and other relatives emerge behind his coffin following his funeral service. There were emotional scenes at the funeral of young cricketer Jack Glenn today as his family spoke of their devastation mixed with relief that he had been returned to them. Jack’s family were finally able to lay him to rest following a relentless eight-week search along the River Foyle in Londonderry involving hundreds of people and various agencies. A large crowd attended the funeral of 23-year-old Jack Glenn. Jack’s parents Colin and Hester and his younger sister Katie led the funeral procession as the hearse moved off from his grandparents’ home in the Waterside area of the city this afternoon. 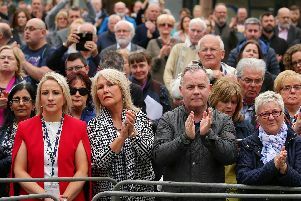 As the cortege wound its way along Limavady Road to Ebrington Presbyterian Church, hundreds of local people stood sentinel along the roadside with their heads bowed. Outside the church, some of the hundreds of volunteers who had been helping the family in the search along the River Foyle, formed a guard of honour as the hearse carrying Jack’s coffin - adorned with a single, large bouquet of red roses - arrived. All the volunteers wore the same orange high visibility vests they used on the search, with the hashtag used to raise awareness about the operation, #getjackback, printed on the back. Jack Glenn was a talented young cricketer. The search for the talented young sportsman had been ongoing since he was witnessed entering the river on February 2. His remains were finally recovered from the River Foyle on Monday by the Boyne Fisherman’s Rescue crew, who had been taking part in the search operation. The railings of the Church were lined with representatives from various organisations including river search and rescue crews from across Ireland, St John’s Ambulance and Foyle Wanderers F.C. Hundreds of people had earlier packed into the Church, while hundreds more lined the walls for what was a deeply personalised and emotionally charged service that brought many to tears. Jack Glenn's relatives emerge following his funeral at Ebrington PResbyterian Church on Saturday afternoon. Opening the service, Reverend Paul Linkens expressed sympathy to Jack’s family and spoke of how the tragedy had proved a great leveller, uniting people from all traditions as they searched to get Jack back to his family. He said: “The family wish to convey their heartfelt thanks to the people who gave of their time sacrificially to search for Jack. “There was help from many quarters, including local cafes and retailers who supplied food and refreshments for those helping at Camp Jacko. “The people who visited the camp came from different backgrounds and traditions and some who had been through a similar heartache, and whatever your faith tradition is, whether you share this tradition or have no tradition, you are very welcome here today. In a statement read out on behalf of the family, Jack’s uncle thanked all those who had searched by river, land and air over the previous two months. “We will never ever be able to repay yous that made it all possible. He spoke of how ‘wee Jack’ as he was known, was the first born grandson and “became the centre of all our worlds”. “We watched him get his first tooth, say his first words and take his first steps. “We watched him dance and perform as he watched Barney the Dinosaur in younger years. The congregation was told that Jack and his sister Katie were the “two wee blondies” who were their parent’s pride and joy. He added: “Jack was an incredibly intelligent young man, he breezed through school but really his only interest in school was the craic with his friends, and sport. He outlined how Jack had played with, among others, Fox Lodge, Bready and Glendermott; had captain of the Foyle College team, and had played for Ulster Schools, and added that “his real pride was representing Ireland at Under 13, Under 15 and Under 17”. “Jack also loved his rugby and football. He was an outstanding goalkeeper for many a team. He was just a natural sportsman. Reverend David Latimer related how Jack’s mother Hester had three weeks ago been walking along the river from Da Vinci’s Hotel to the Foyle Bridge as the search was ongoing, when she found herself in the presence of a stranger. “He is up there in Heaven with Granda Kee, who he loved very much as well. “Look after him daddy, I know you will,” she said. Later in the service, Rev. Linkens said the family really appreciated Arsenal Manager Arsene Wenger having taken time out to write to them during the search for Jack. And there were heartbreaking scenes after the service as Jack’s relatives prepared to accompany the young Londonderry man on his final journey to Altnagelvin Cemetery.